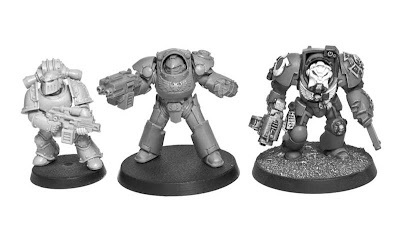 The new Forge World Tartaros pattern terminators just don't impress me. I'm not "wowed" by them like I wish I was. I saw them and my first thought was, "That's it?" Maybe one of their other new patterns will have me singing a different tune when one of those get released in the future. They mentioned in their teaser email that "several types and patterns were developed concurrently. Of these, the Indomitus pattern is perhaps the most widespread..."
Of course that could mean the models that we all already have are the Indomitus pattern and we just don't know it yet. I suppose if you name one kind, you need to name all of them then. I think my biggest complaint is the crux on the shoulderpad. It looks like an afterthought almost. Kinda like we really ought to find a way to squeeze that on there. The torso is alright, reminding me of a smaller contemptor pattern dreadnought of course. The helmet misses the mark for me. The legs are missing the articulated knee joint, but have the same look with the raised knee armour plate that they seem to like to give to other models as well. I do like that look and I think if I can figure out a way to convert my models into having that squared off knee armour, I might try and do it. I've made a few different variations over time as I've looked for ways to make my terminators stand out from everyone else. I started by making the roman style shoulderpads seen on some of the earliest marks of armour. While it might seem odd, I had to make these way back when because these kinds of shoulderpads weren't available as 3rd party bits online. To this day, this guy remains one of my favorite conversions. He may not be the best, but he looks different and he has dual thunderhammers. That was back before you could do that too. The shoulders are what set him apart though. Once I knew I could make one, I figured I'd try my hand at a squad and eventually did it with one squad in my Lustwing force. They have similar shoulderpads and the added collar piece too. I really like the look that gives them. I know I'll be adding this piece to my new terminator squad. Once I made that squad, I tried to convert even more on a model and added bulked out greaves to my previous Belial conversion. The idea was a cool one, the execution was alright... but it needs work. The scale is off and needs to be refined for the model to look right. And one last thing you can do to give your termies a slightly different look is to mount the regular shoulderpads upside down on the model. Cut the little tab off that sticks down lower (and remove any sculpted elements) or use two blank shoulderpads for a completely different feel. You don't see this very often on models. I've only done it once to give my Chaplain conversion a completely different feel and set him apart from all the other models. Maybe I like the GW ones because it's all I've ever known. I mean, I've made my own armour adjustments before and created the older style of shoulderpads with some success. I can tell you they definitely stand out on the tabletop once you start altering them. Here's to hoping Forge Word comes out with some other variations that really wow me. Maybe I'll be convinced to pick some up then. Until that point, I'm going to be adding my own collar pieces and my own roman style shoulderpads. And if I can figure out how to do it, I'm going to give them that squared-off knee armour. I really like that look. Thats exactly what I thought when I saw them...: "A smaller contemptor pattern dreadnought armor thingy". I mean its nice if you do a consistant looking pre-heresy army and all, but it really has no "wow" factor. They're very, very nice models, unfortunately, they're not nearly bulky enough to be Terminators, and unfortunately they can't be fielded as anything else (due to wargear). You're lightning claw termie is exactly what I thought a pre-heresy suit should look like! I'm sure that's what they looked like in the 'Horus Heresy Collected Visions' artbook. Forge World are doing lightning claw and thunder hammer and storm shield versions. Also, that squad does have bits for chainfists. What we're missing are assault cannon and cyclone missile launcher. One point, which might sound nurdy, the Crux Terminatus is said to contain a piece of the Emperors armour from when he confronted Horus. This is pre-heresy/heresy era armour? @Anonymous - no this isn't pre-heresy armour, it is simply a variation of terminator armour. FW do say that it is less bulky and more high-tech, and therefore far less widespread than normal terminator armour. personally i really like them. I actually did go 'wow' when i saw it, but then, i have never been much of a fan of the traditional armour. if anything, the assault variations look even better, with the running poses suiting this armour well. i am grateful for some dynamism actually, as this would never have worked with the normal suit. I was also a bit disappointed: The models are cool but in a way, they're neither here nor there. 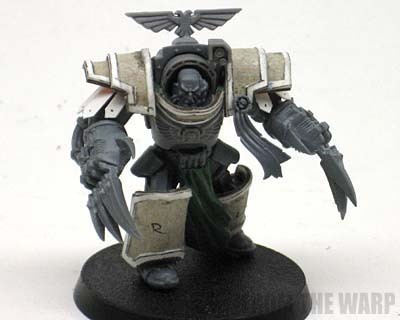 Too close to the "modern" Termies and not nearly close enough to the real Pre-Heresy ones, I think their armour is called Cataphract pattern IIRC. It admittedly doesn't look as spectacular as a conversion using 3rd party bits or sculpted shoulderpads, but it works well enough. I really like how that chaplain conversion gives a wider profile to the model. I may steal that for my next Space Marine project. They still have the metal diaper effect going on though, a shame they didn't try to fix that. Zaphod Beeblebrox: Right... a smaller dreadnought. I think with all the resources they have at thier disposal and the free run they seem to have in creating things, we'd have something... more. GoldenKaos: You're right. They are nice. And that's my issue. I don't want "nice," I want WOW from Forge World. Anon: A very, very good point about the crux if this style lass in the pre-heresy time frame. I think terminator armour is not as well documented as power armour as to its development lines in relation to history. And it's not being nerdy either. I do like the claws they have for the new models though, they seem correct for the period. Atreides: I haven't seen the dynamic poses, or if I have, they haven't stood out to me. KrautScientist: Thanks. Love the termie you have there. the shoulder plates are a good fit on the model. I would have never thought to use that particular bit. Spyrle: He is a bit wider looking isn't he. It's not much, but just enough to catch your eye. dancing platypuss: I called it roman for lack of a better word for it. BUt you make a good point. Things would indeed carry over through time so to say. Jacob Pøhlsgaard: Thanks, there's an image I won't be able to escape now. These are not pre-heresy, they are just another pattern of terminator armor. I don't see forgeworld coming out with a bunch of different terminator varients, just add-ons for these. (TH/SS, Lighnigh claws, a decorated set, etc. The Indomitus pattern they mention is the GW standard terminator armour. i must the only person in the world who likes them! i think, a bit like the contemptor, its a basic model that we'll see variants of, but even in the vanilla form i quite like the look. Anon: I'm hoping Forge World will come out with more variants. I'd love to see what they come up with. I do like some of the add-ons though like the claws. Matt: I don't hate them. I like the legs. Can I just buy those? Oh good, its not just me that is thinking the Tartarsauce Terminators are underwhelming. 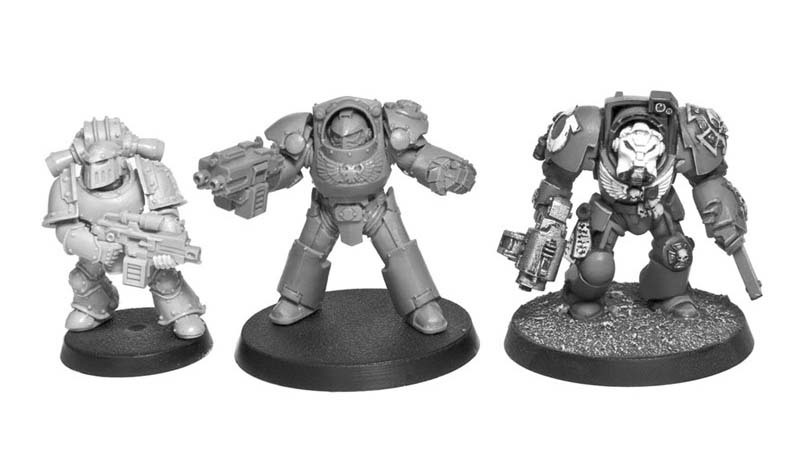 I do much prefer your pre-heresy conversions Ron, they retain the "aggressiveness" of the standard Terminator models. I agree Ron, quite underwhelming. The thing I most dislike about the contemptor dreadnaught and this terminator armour is the chest. It has some weird bulbous look to it that just doesn't sit right with me. Sorta reminds me of a cauldron. I'm in the process of heavily converting my own Deathwing. I'll shoot you an email at some later stage to see what you think. I like them, but I really like contemptors and Mk4 power armor. These are basically a combination of the two, so they naturally tickle my fancy. I'm not too keen on the shoulderpads, but I'm thinking that can be fixed with some 3rd party bits. Dugatron: I'd love to see them. geneguard: I like the older Mks of power armour as well, but these just don't connect with me. I think if I can get some sets of legs to work with though... I'd be in using those. 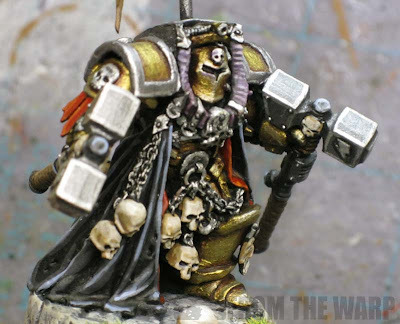 Have to say I absolutely love that Chaos Terminator Lord model conversion. I have one and it has to be my absolute favorite Chaos model ever. 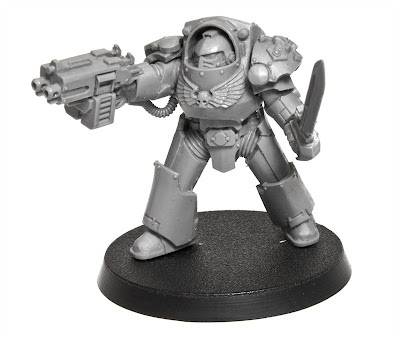 I like bits of the Tartaros model, like the Twin-Linked Bolter and the thighs (odd to say, but the plastic Terminator has ridiculously thin ones), but I don't like the shoulder pads (even though I agree they add much-needed mobility to the arms) and the helmet is too power-armoury. Glad I'm not the only one who wasn't amazed by these terminators. The vast majority of forge world models look brilliant but these are not doing it for me. It's kind of like not salting your fries, sure they're fries but you know they're missing something! I really like these new terminators. I love the crispness of the sculpts. I love the fact that I could have a contempt, these guys, and some mark iv guys all together in one force and have the pinnacle of Imperial technology before the Heresy. One of the nicest things to me is that these guys look like MIV PA, which has been augmented into terminator armor. The smaller PA helmets really help sell the scale as well. I wish I could trade in my plastic terminators! ieuan: That made me laugh and it's so true. Drathmere: Now I thought these weren't pre-heresy due to the crux on the shoulderpad. I'd agree though that you'd have a spectacular looking force combining all those elements, that's for sure. The sculpts are crisp too, no doubt about that. But as far as trading new termies for these... I'll keep mine now. I'll take some of the new sets of legs though. I like those. ieuan: Now that made me laugh. Drathmere: I thought these were post heresy due to the crux on the shoulder and the whole bit of the Emperor's armour included in it thing. I'm not trading my termies in for these though. Maybe the sets of legs, but nothing else. forgeworld are supposed to be better than GW, better sculpts, better design and the models that you really want to have but just didnt know it yet, but these look like they were rushed, the crux you mentioned is a poor version of the standard crux and the forgeworld staple of adding that little more realism to the model is just not there. 5 terminators and 3 of them look the same. poor. mk 4 was the pinnacle of armour technologicaly and in mobility, but for only one fact. it was never designed with the idea of fighting other marines and resisting bolter rounds. the Tartaros pattern terminators,mk 4 and contemptors all have a similar aesthetic so we can presume they are from the same period/or forge world. 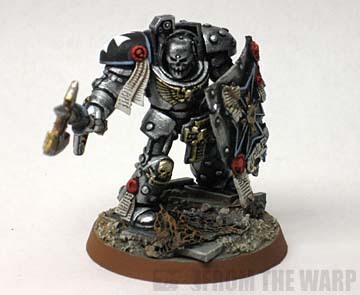 I would guess the space wolves terminators would use a heavier pattern armour if you follow the premise in prospero burns that they follow the school of thought that there weapons are x strong so we need armour y strong to deend against it. I just hope they do some cataphracti armour based on collected visions! As for the crux i do agree that its a bit rushed and stuck on there for 40k players where the pre heresey crowd will be sanding it off. I was lucky, or so I thought, to get a set at the recent Open Day. They are POOR. They areborder line 'Failcast' with mold slip, low detail and miscasts. I have rang to complain and have been told to send them back FREEPOST and they wil send new ones out when the next set are cast up. However I'm tempted to say I just want my money back I'm that disapointed. Plus some sculpts aren't proportioned correctly and they left foot is smaller than the right. Very disappointing. Don't waste your money guys unless you REALLY want some. They are however brining out a full set of weapon options in the future. Anon; Yikes, sorry to hear about your experience. They must really be awful to want your money back. I myself love these new termies. i THINK these are a reimagining of the OLD OLD metal termies, of which there were 3 different "prototypes"
The fluff at the time also had the different types being created concurrently. i'l try to dig the OLD wd out to see what it said exactly. 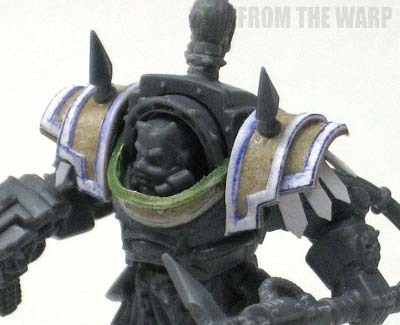 Anyway, all these old marks of armour look 100 times more interesting than this new fangled "cataphrakti" armour which has popped up in all the HH artwork and peoples conversions. I think they look like arse. I'm hoping FW stick to the threee old protoypes for their inspriation and ignore this new cataphratii rubbish! Marsekey: I'd love to see what you come up with the old WD if there is something in there. That would be cool to see. I'm a big fan of the older styles you see in the HH books. I think it's got tons of character. These just don;t have that for me. i LOVE the new pattern. i never did like the plastics GW has made. for one (till the SW pack) the helms had no vents on the fronts, and whats with the HUGE scanner on the tops???? my friend has also had the miscast issue with his and was told the same, freepost return. i however am still awaiting packing on my order..... hopefully its a remold job and the new batch are sweet. cpt codpiece: Really, you never liked the GW version? I think those have tons of character. I'm cutting the scanner things off my termies this time around. It does give them a slightly sleeker look I think. A little bit cleaner overall. Thanks for the link to the super old patterns of armour. I wonder if FW will touch on those with some other variations in the future. That might be interesting to see. I agree about the pointy pads. I sculpted some for a friend of mine and they look so different than anything else out there. yeah, i never could get away with the plastics Ron. all of the scanners got cut off, storm bolters were cut to resemble the old sickle mag ones. if the old early 90's metals were bigger i would have just stuck with those, but chaos ones are even harder to find in numbers than the old inquisitor. cpt codpiece: Indeed, the old Chaos ones had some real character. The new plastics are alright, but those old metal ones were wonderful. I think if the scale had been the same between the plastic and the old metal ones, I too would have kept the old metals ones as well. I have to disagree with you, Ron, I absolutely love the look of the Tartaros pattern Terminators. But then, much like Cpt. Codpiece, I've never been a fan of the plastic GW termies. They've always seemed... off, whereas the FW termies make what is (to me, at least) a key link between the dreadnoughts and terminators. Tactical Dreadnought Armor it may be, but I really see no similarities between terminators and 'noughts. With the advent of the contemptor and the Tartaros-pattern terminators, we see an aesthetic link developed. I don't think that GW's terminators really convey the purpose for which the armor was created, whereas the bulkier Tartaros pattern resemble nothing so much as tiny walking tanks. Just my two cents though. As an aside, your site is absolutely brilliant, and ridiculously helpful. Unknown: I see what you mean about the visual link. I can appreciate that.